The new modern web parts rolling out to SharePoint right now are fantastic and getting better every day. One of the ways modern web parts can be used is to build modern pages for sharing news across an organization. A common requirement for organizational news is to have an expiry date associated with each one. Although you can allow old news to just roll off the view as more recent news is published in its place (and this is a perfectly legitimate option), sometimes you don’t want expired news to show after it expires. I was recently asked if this is possible. It turns out it is and in fact there’s more than 1 way to do it using Modern Pages and search with the Highlighted Content web part. The option you choose depends on where you want your news items to show! Option 1: Use a Page Property on the Site Pages library, and filter on the Page Property expiry date being after today. Using this technique, you can display non-expired news pages on the site, however sorting by expiry date is not allowed and you cannot filter these pages on another site, including a Hub. Limitation for BOTH options: as of the time of this writing, all filters in the Highlighted Content Web Part are OR’d together which means you can’t have multiple combined conditions to limit your results. For this reason, you can’t filter on two properties of the Site Pages library if you had a requirement to do so. Also, this solution will exclude pages with NO expiry date. I’ve made this work for me as the home page and all summary pages have no expiry date – only news pages will have an expiry date added. [Update February 7, 2019] This solution was built using Modern Communication sites. If you are using Modern Team sites with a Group for this solution, ensure your userid is explicitly identified as a site collection administrator on the site for Option 2 – it’s not enough to be in the Owners group. This is so managed properties will be created in the search schema, a requirement for Option 2. Please refer to another blog post where I explain this current Modern Team site behavior – Crawled & Managed Properties in Modern Team Sites. Step 1: Add the Page Property to the Site Pages library. To do this, browse to the library settings and add a column to the library (can be either a list or existing site column). For this example, I added 1 date column called ExpiryDate. Step 2: Add some pages to the Site Pages library. Make sure you have a mixture of expired and non-expired pages by setting an expiry date accordingly. Publish each page. Step 2: Add the above site column to the Site Pages library. Step 3: Add some pages to the Site Pages library. Make sure you have a mixture of expired and non-expired pages by setting the expiry date accordingly. Publish each page. Step 4: Wait a period of time for the above pages to be crawled by the search engine (~15 minutes). We need to associate a managed property with the ExpirationDate crawled property created from the site column above. This is done in the search schema at either the tenant or site collection level. In this example, the mapping was done at the tenant level so it can be shared across all sites in the tenant. Edit/Map the RefinableDate## managed property to the crawled property automatically generated for the ExpirationDate column, in my case ows_q_DATE_ExpirationDate. The alias name is optional. Note: important to understand with the RefinableDate## managed properties are the settings that are enabled for it. This is what allows us to filter and sort by the property in the highlighted content web part and why we need to do this mapping. Now that the managed property is configured, we can start filtering our news pages! It may take a few minutes for the mapping to be seen back down in your site with the news pages. You’ll notice with this option, we can now sort by the ExpirationDate custom page property that is mapped to RefinableDate00. With Option 2 only, we also have the ability to show this filtered set of pages on any other site in the tenant, including a SharePoint Hub. This is why the managed property option is a scalable approach. A practical use-case for this would be divisional news sites all joined to a corporate hub. Each divisional site would have the ExpirationDate site column defined and set on their news pages. At the Hub level, a Highlighted Content Web Part can look to all sites joined to the Hub and filter/sort based on the same managed property. In this image, we’re filtering all non-expired news pages from across all sites joined to the Hub. Awesome! To demonstrate this, in the image below, there are 2 Division sites joined to the Corporate News Hub (Division and Division 2). There are 4 non-expired news pages showing in the Highlighted Content Web Part from the 2 sites (yellow and blue stars) and the combined results are sorted in Expiration Date ascending order. What a smart use of search! As time goes on, additional capabilities will be introduced to the Highlighted Content web part to filter content to meet more complex requirements. It still has a long way to go before it has the flexibility and configurability the Classic search web parts currently have, however there are many features of the modern web part I love better: responsive design, great out-of-the-box visuals, and easier for a Power User to configure. I’m looking forward to the advancements being made to the modern search web part… until then, learn how to leverage the current capabilities and incrementally build upon them as new ones are added. Would you like to connect with me to ask questions, use me as a thinking partner, request feedback, learn more about what I do, or learn more about what I can do for you? That’s great! I’d love to connect and find out more about how I can support you in anyway. Book a call with me on Pick My Brain! Previous Post: List View Threshold Error… watch your column types! 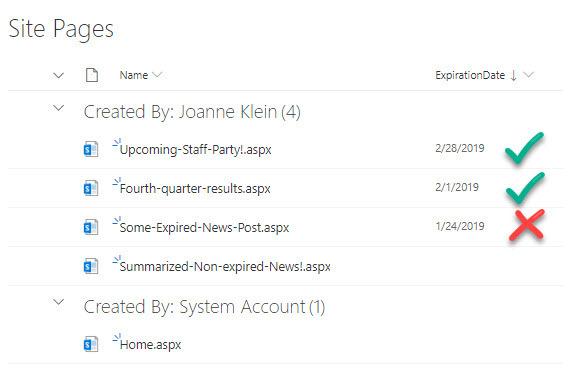 You don’t need to access the SharePoint Admin Center. Site collection admins can do it from the site settings page.